I try to eat clean 90 percent of the time but every Sunday I have a cheat meal which means I can eat just about anything I want. But I’m not going to scarf Cheetos and Cherry Coke just because they’re available, I want something good! And if I’m going to indulge in something, it has to be worth the calorie count. So last week when I was craving chocolate, I thought, why not make a tray of brownies? Because you know, sometimes a girl just has to have her chocolate fix. That’s where this recipe for brownies comes in; they’re perfect for satisfying your chocolate cravings. Did I mention this recipe is oh so easy to make? They’re perfect as a sweet treat, or as a pick me up for those times when, let’s say, you’re feeling down because you’ve been disappointed by a friend who commits to something and then doesn’t follow through. Personally, I don’t make promises I can’t keep but what I can tell you about these brownies is that if you’re craving chocolate, you’re in for a real treat! That I can promise! These brownies are made with your basic ingredients – eggs, butter, flour, sugar and cocoa powder, but they all come together to make a truly exceptional dessert! We’re talking about a brownie loaded with a ton of chocolaty goodness– chocolate chunks and just the perfect fudgy texture. These are supremely smooth, moist and chewy, not crumbly or cake-like at all. They’re rich and decadent, but don’t worry, they’re not overly sweet. Enjoy them while they’re warm with a creamy scoop of vanilla ice cream, or alone with a tall glass of milk! Line the bottom of a 9″x13″ pan with a piece of parchment paper and lightly grease the sides with cooking spray or butter. Add the eggs into a mixing bowl and beat together with the cocoa powder, salt, baking powder, espresso powder and vanilla until smooth. In another bowl, add the sugar and butter and melt the butter in the microwave or over a water bath. Stir and heat the mixture until the butter has completely melted. Continue to heat the butter/sugar mixture until it reaches a temperature between 110F to 120F (make sure it doesn’t bubble or boil) – the heat will help to dissolve the sugar. Add the butter/sugar mixture to the egg/cocoa mixture and stir until smooth. Next, add the flour and the chocolate chips to the batter and continue stirring until smooth. 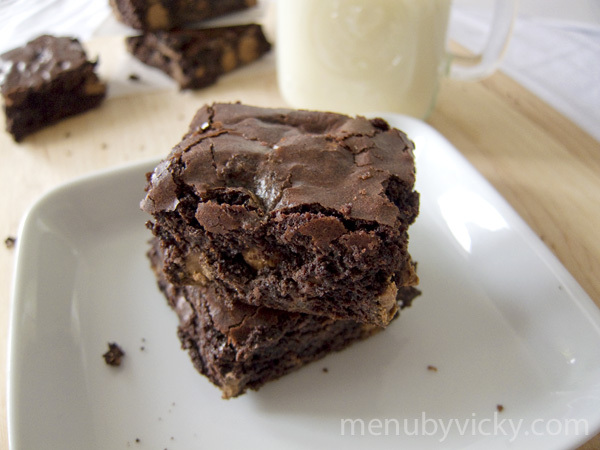 If you want whole chocolate chunks in your brownies, allow the batter to cool for about 10-15 minutes. Otherwise, the chocolate will melt into the batter. Pour the batter into the prepared pan and bake for approximately 27-30 minutes or until a toothpick inserted into the center of the brownies comes out clean. Remove the tray from the oven and allow to cool for several minutes before cutting and serving. 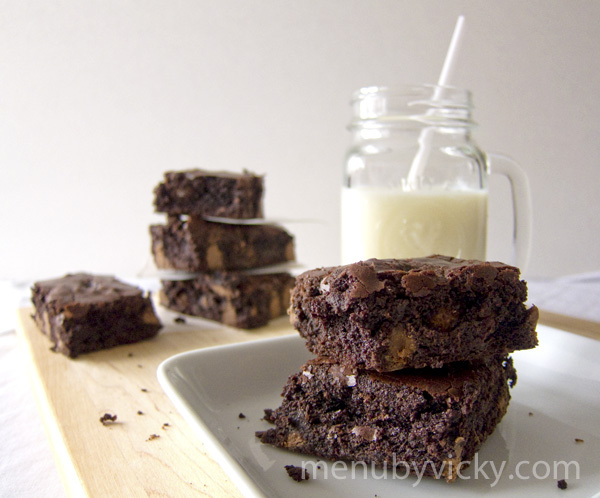 Recipe notes: My brownies were done at 27 minutes so keep an eye on your tray closer to the end. Looks and tastes like a treat! Last time I made brownies (many blue moons ago) I put in chocolate chips too. However by the time the brownies were baked, the chips were already melted into the brownies, so it had a wierd uneven texture – thought it tasted fine. Looks like I’ll leave it to the pros!